I'm right smack dab in the middle of Thanksgiving dinner preparations but thoughts of my December Memories album keep popping into my head each time I wander into my craft room. I see my supplies just waiting for me and we all know that December is just around the corner. So here we go with another post full of December Memories inspiration. 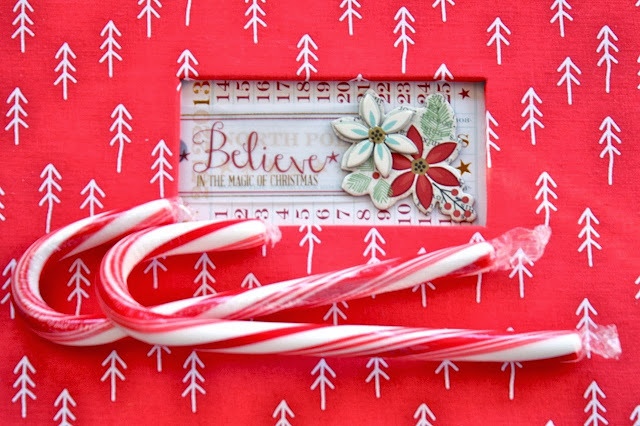 Grab a candy cane and join me. You can view my December Memories 2013 album cover and first cover page in this post. You can view my December Memories 2013 pages 1-10 in this post. 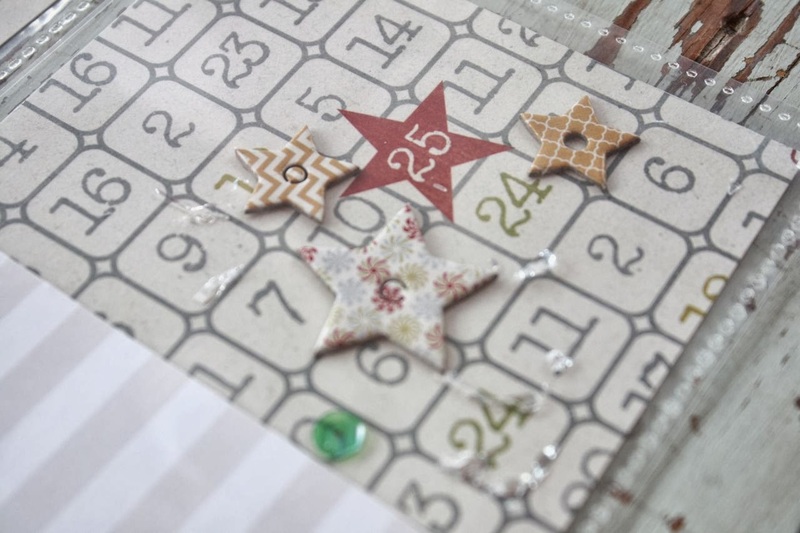 This year I have decided to keep on doing my December Project Life just like any other month. It will consist of daily photos of our everyday life, basketball games, Charlie, and random photos which will definitely include holiday happenings. I'm fill my second Project Life album for the year quickly and I would really like to just keep it at 2 albums. So my plan for Project Life is to limit the number of inserts I create, keep the pages flat and keep it at 2 albums for 2013. 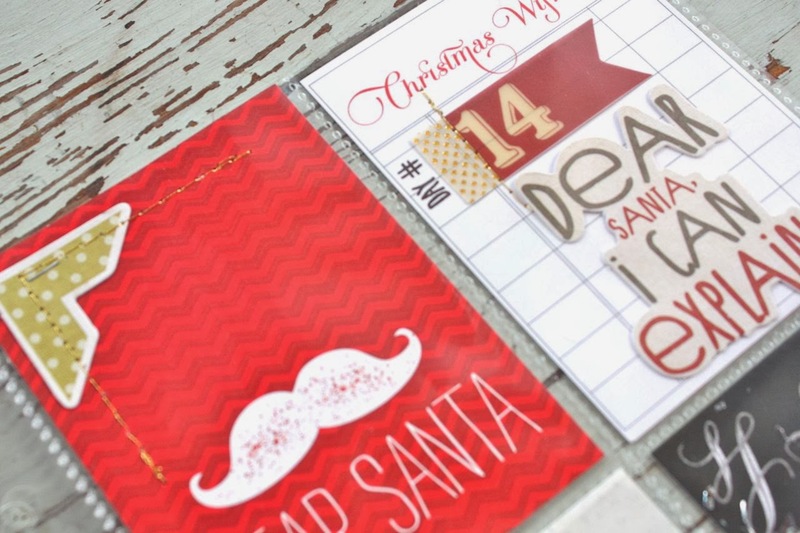 I will be using any leftover supplies from my Gossamer Blue December Memories Kit + there will a wonderful Themed Kit and Life Pages Themed Add-on Kit coming in December. Those items + anything I have in my stash will easily get me through the month of December. 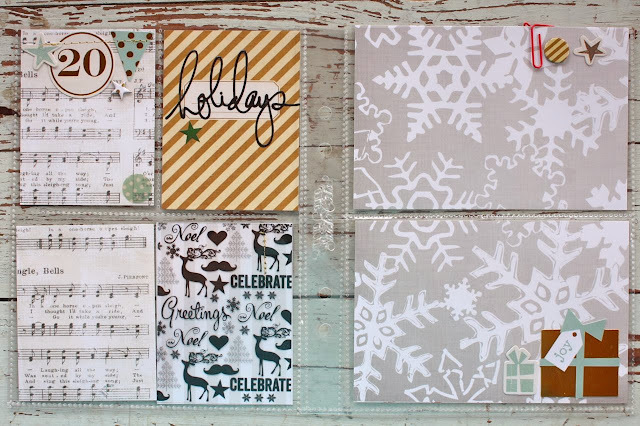 My December Project Life pages will have hints of the holiday just like any other holiday months in this year's album. So let's take a look at some more days of my 2013 December Memories album. You might recall from my post featuring days 1-10 that I'm using the number system as more of a listing of memories....not necessarily a chronologically ordered album of days 1-31. 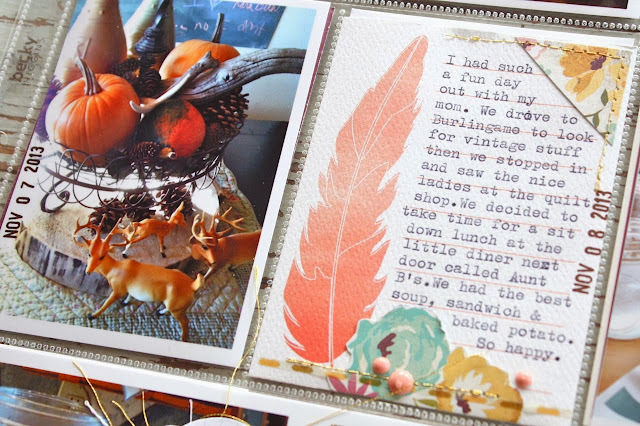 Each 2 page spread will represent a holiday moment. Page 11. I'll be using this for a random holiday event but since I added the ticket strip, I might use it to list our holiday movies we view on tv or at the theatre. 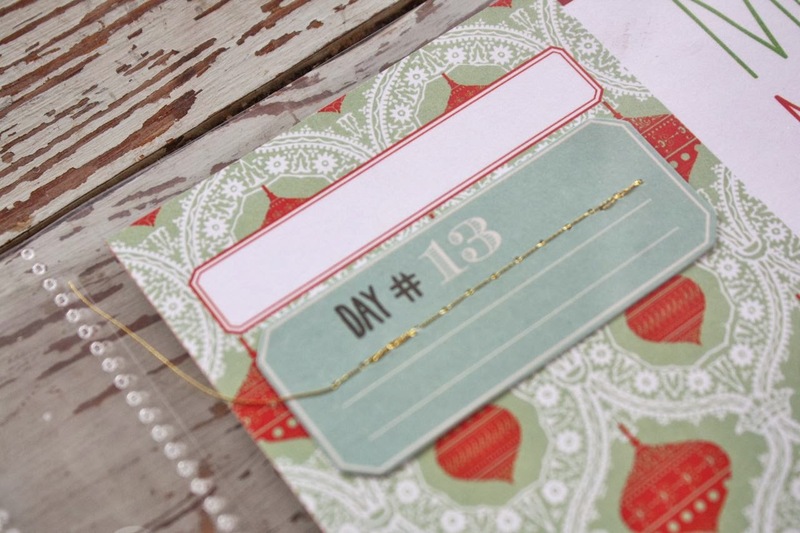 Page 12 is all about the list making. I plan to compile all of my actual written lists in between these two pages. 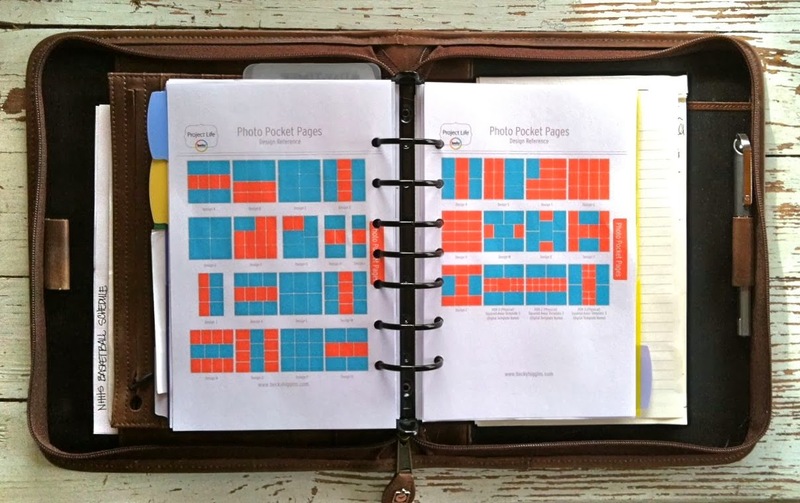 Some might go in extra page protectors, one might go in the sack or adhered to the front, whatever goes. Tip: Adhere sacks and pocket type inserts to the front of the pocket insert. This way the tags or inserts can be removed easily for viewing. These were a fun addition to the December Memories Kit from Gossamer Blue. You can get a view of the December Memories kit items in this blog post, although the kit is now sold out. I'm just so tickled to be a part of Gossamer Blue...Lori is so generous, down to earth and she selects the best items for kit. Just love her. 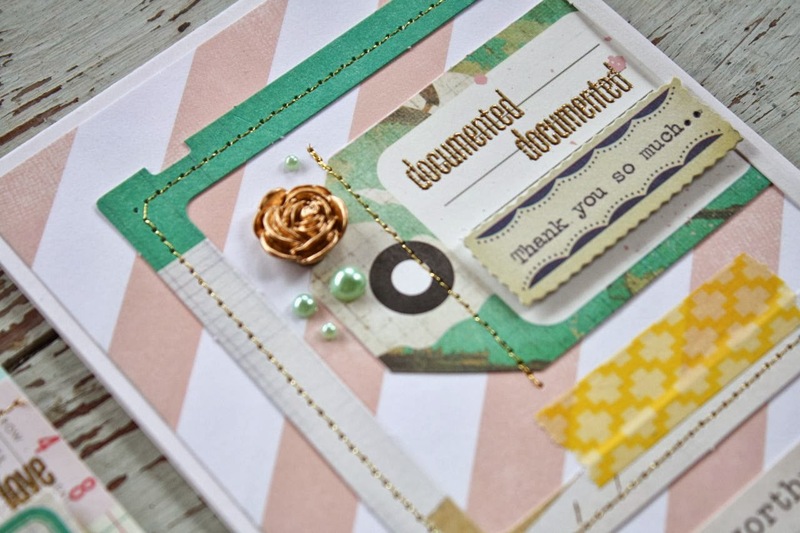 This journaling card with stitched embellishments is just the perfect touch to add to the list making. Santa always needs a little helper, right? 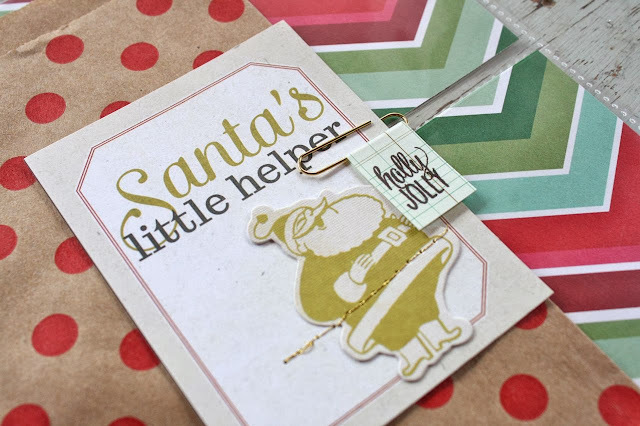 The holly jolly clip was an item I sold in my shop earlier this season. As a reminder, I'll be using gold stitching throughout my album this year. It goes well with so many of the gold accents that I'll be using throughout my album. Page 13 notes the countdown to the 12 days of Christmas. I might add a list in here of what I have to do yet for the month or it might just be reserved for another holiday moment. Here's a view of more gold stitching. I got my thread at Michael's. This big chipboard button with holiday twine is attached to the outside of the page protector. I like to add the dimensional items to the outside so they stay fluffy and tangible to the viewer. 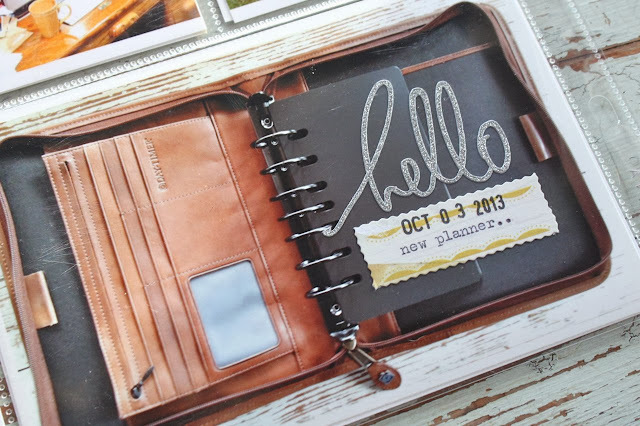 This album is a great way to add more dimensional items to my scrapbooking as I now know that if I want to keep my Project Life to 2 albums per year, I need to "think flat". That also should apply to my rear end and stomach but we'll talk about New Year's goals later. Maybe. Or not. Page 14 is going to be a fun one and we'll see if my family actually cooperates. I'm reserving these two pages for making our list for Santa. In our house, you must believe in the magic of Santa if you want gifts. So we ALL believe. 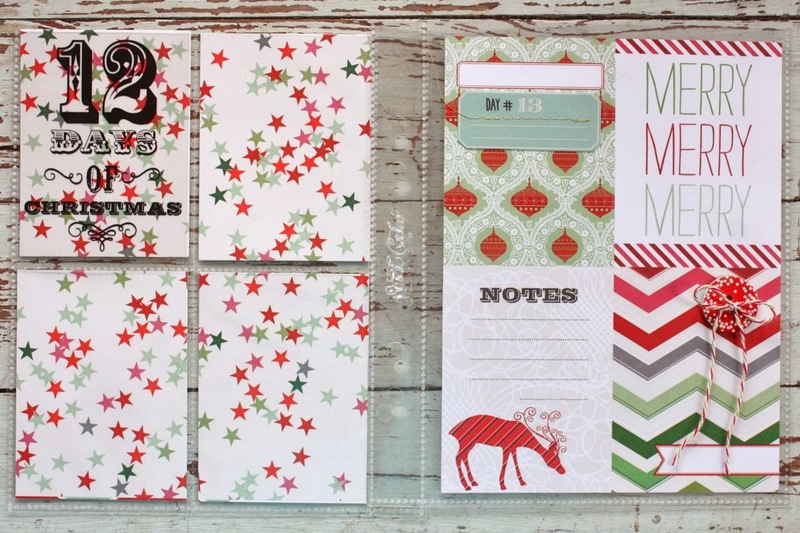 The inserts are all filled with list making and Santa themed items. On the left side I trimmed down some Large White Tags, stitched a line with gold thread and added some gold stamped tags with our names on them. My hopes is that each family member will hand write their wish list. 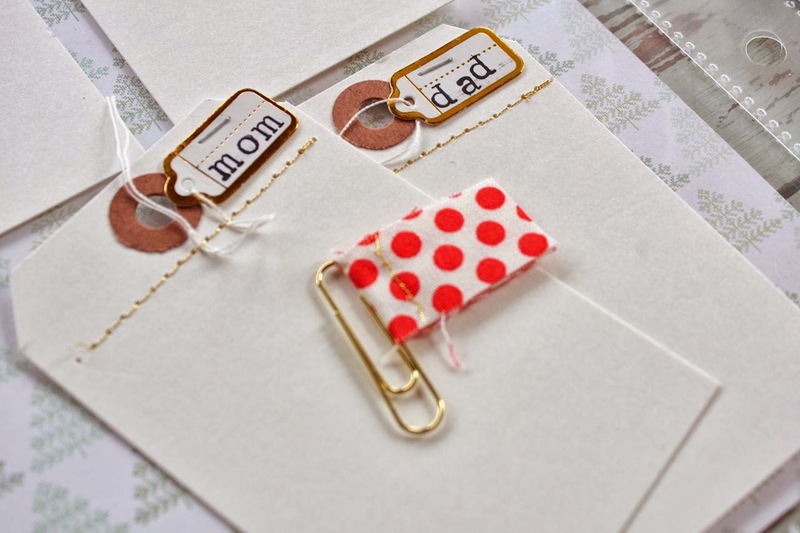 The polka dot clip was from a set I offered in my shop earlier this season. 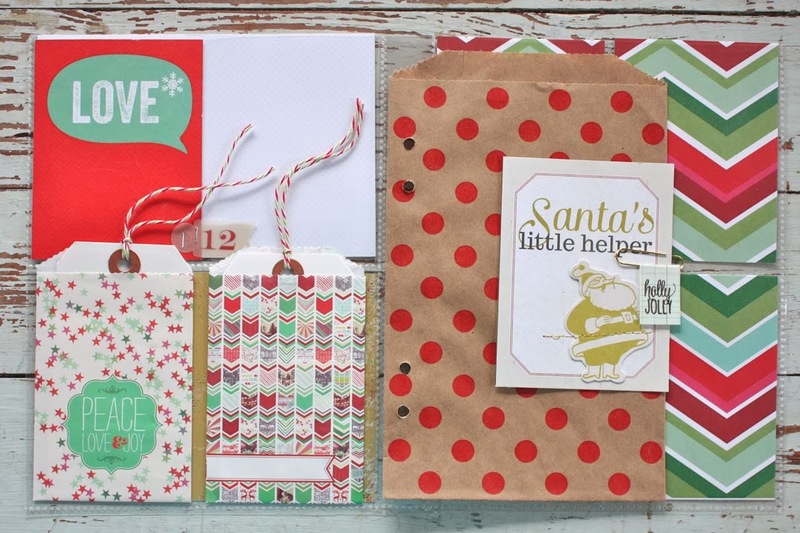 A closeup of the Santa themed items. Page 15 is wide open for whatever. Since this has the sheet music maybe I can capture Jordan playing us a song on her guitar. Good idea Mish, I just thought of that while typing. I filled all of the chalkboard inserts with Fluffy Snow. It just tones down the black a bit and I love the contrast of the sparkly against the dark. Page 16 is wide open also. See those two large red inserts? 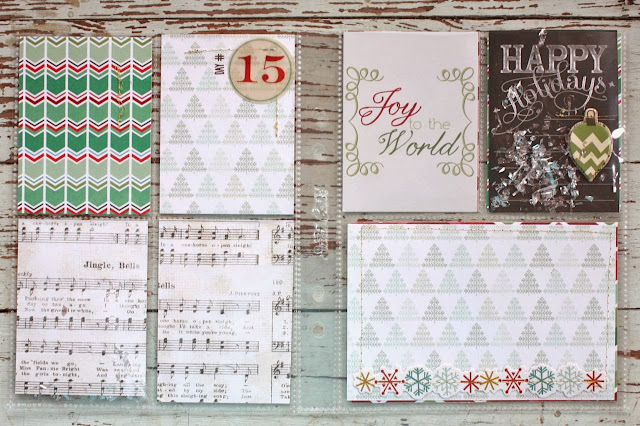 I trimmed a 12 x 12 piece of patterned to 6 x 8 and then down to 4 x 6. 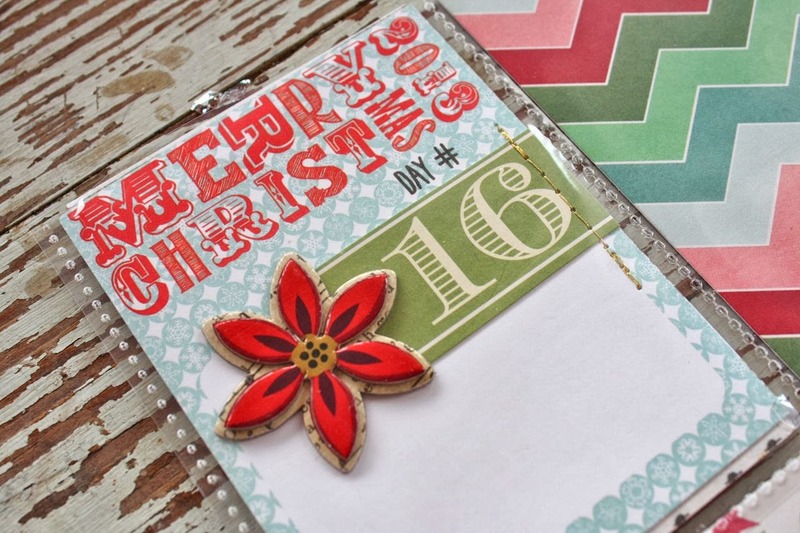 You'll see the two chevron inserts in Day 17, those are the reverse sides of this paper. So on those days I'll have to be careful about stapling and stitching. 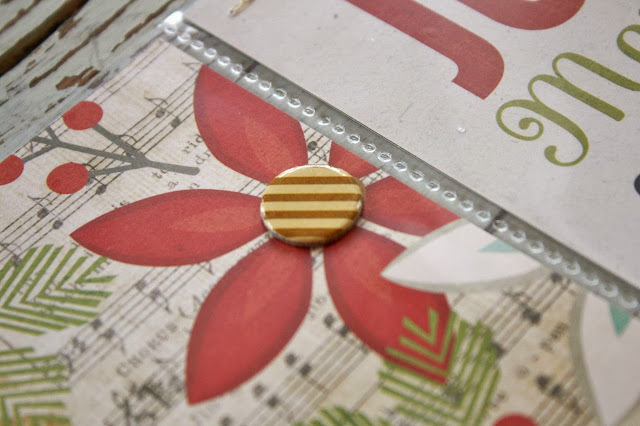 These chipboard accents with a glossy finish were my most favorite items from the GB December Memories Kit. I ordered extra from Pink Paislee to use for my upcoming holiday planners and greeting cards. 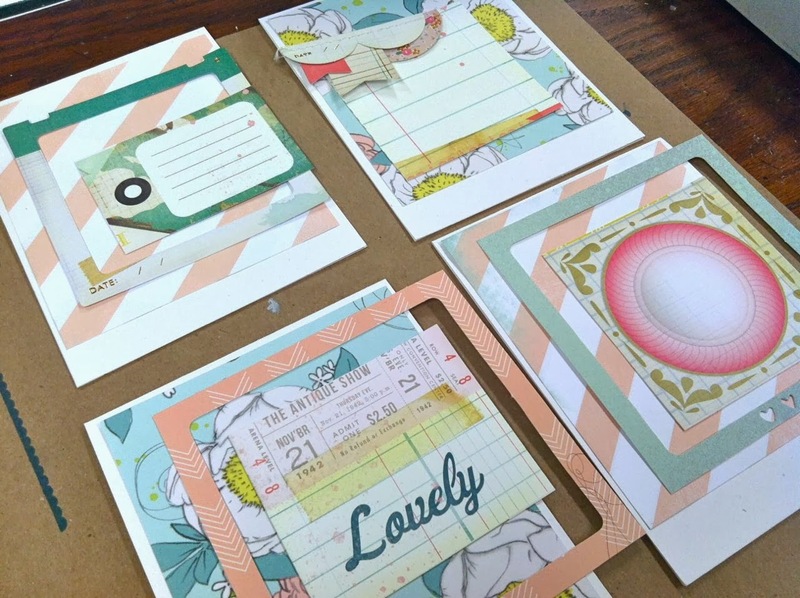 Page 17 with the chevron papers. This page will be used for various photos of the fireplace, hence the warm and cozy flip and chestnuts roasting song insert. 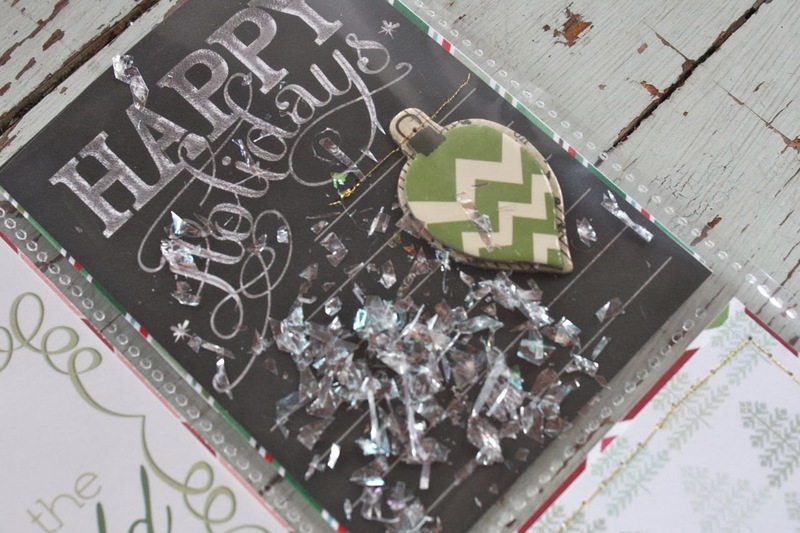 I'll also add my holiday mantel makeover photos in here, maybe with a smaller insert. I stitched on a floral die cut here. 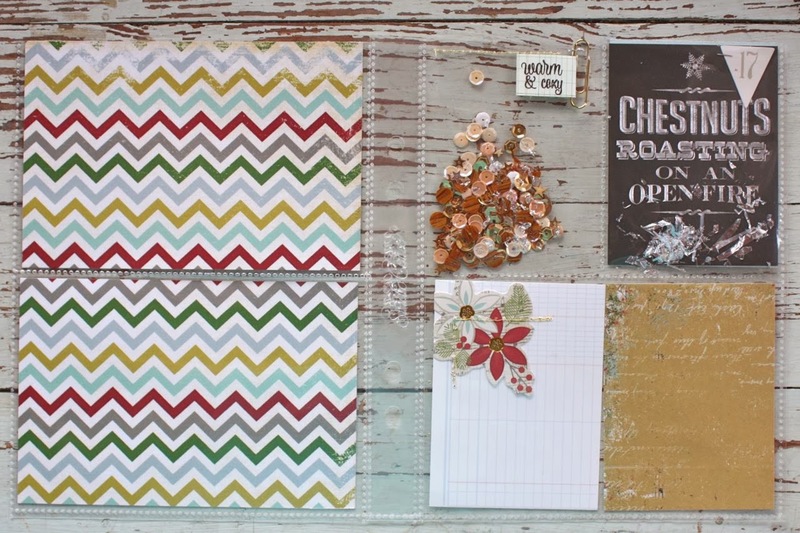 Added my popular Woodland Sequin Mix from my shop in this pocket. And more of the Fluffy Snow in this chalkboard pocket. 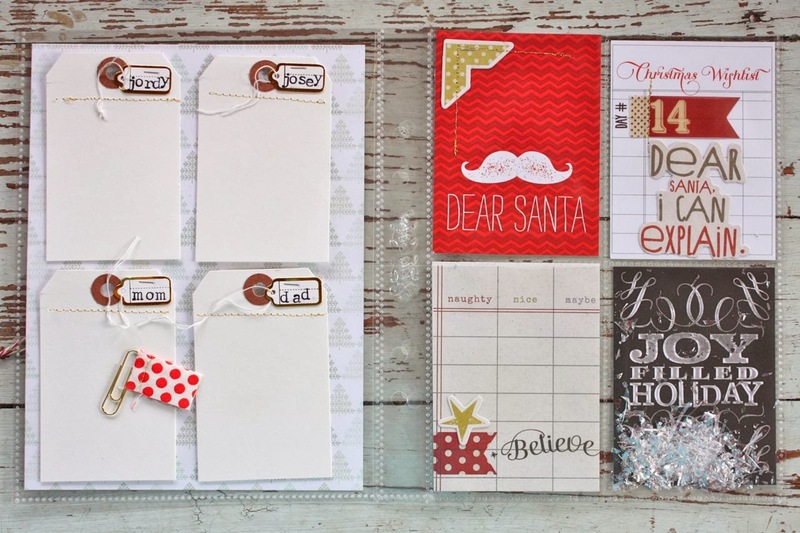 Okay by now you've seen that I've filled each and every slot with a journaling card, sequin mix, tag or sack. So you might be wondering, where do all the photos fit in? My big plan is to now keep my Project Life inserts to a more minimal look when it comes to embellishments. 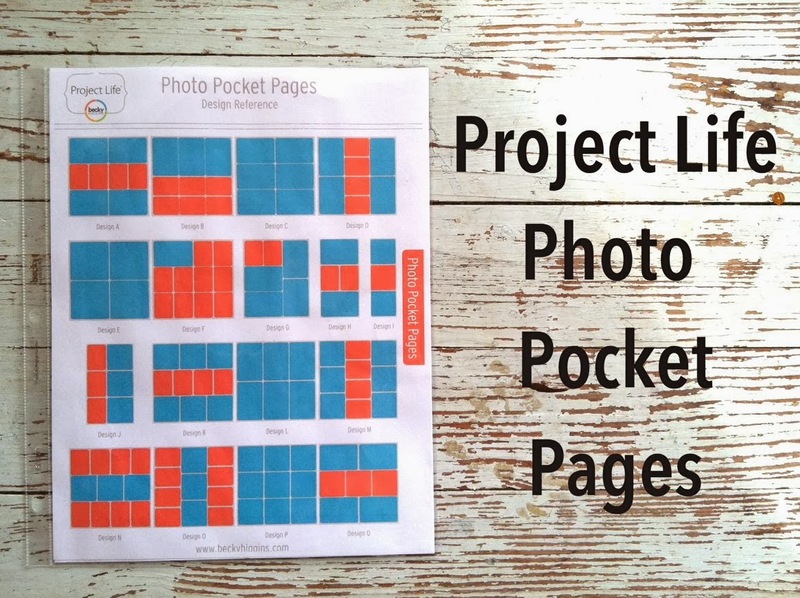 ( I'll be discussing this more in a post about Project Life 2014). 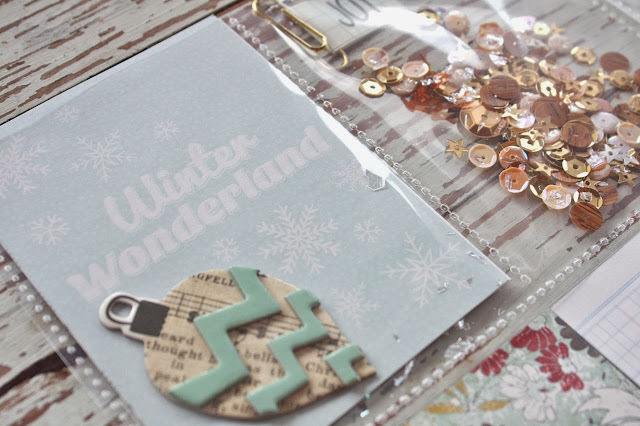 So I thought when it comes to mini albums I can just go all out with the decorating and embellishing and dimensional items. 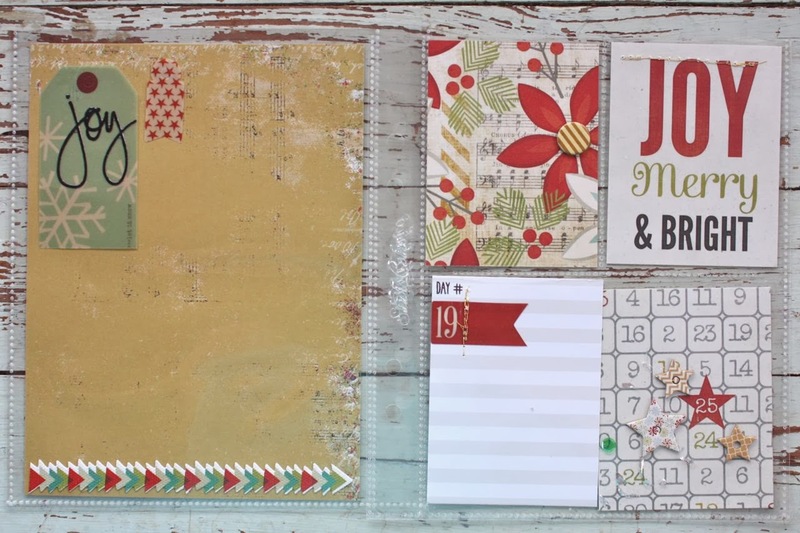 The December Memories kit came with soooo many good products that I want to show them all. 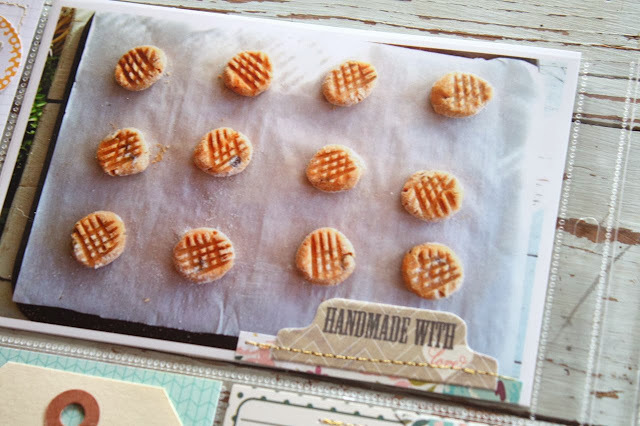 For my photos, I've decided to print them as smaller square Instagrams that will fit onto a 3 x 4 journaling card, leaving lots of the background in sight still. So I'll be thinking "square, square, square" when it comes time to taking photos. Some may be cropped to smaller rectangles also but the idea is to leave the backgrounds showing. Page 18 is a good example of why I want to show off the backgrounds. 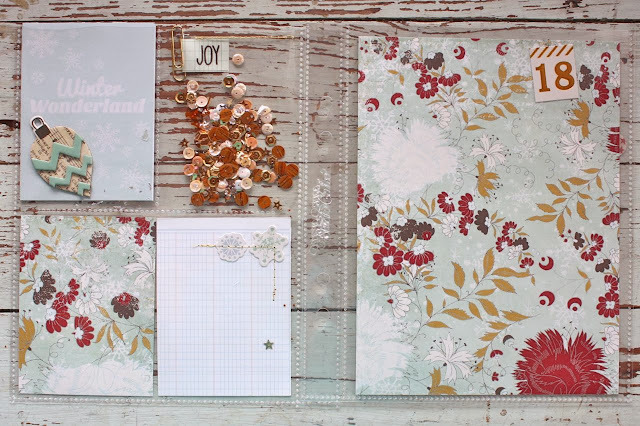 This floral paper is just gorgeous and was another favorite from the GB December Memories Kit. I might use this page for photos of snow if we get any this year. Many of the embellishments are just tucked into the pockets right now & they'll be adhered after I decide the final placement. 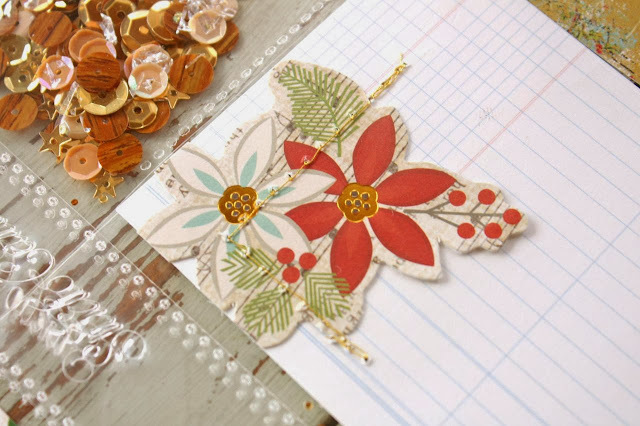 Love these snowflake accents, especially with the gold stitching. Still lot of room for a photo or journaling. 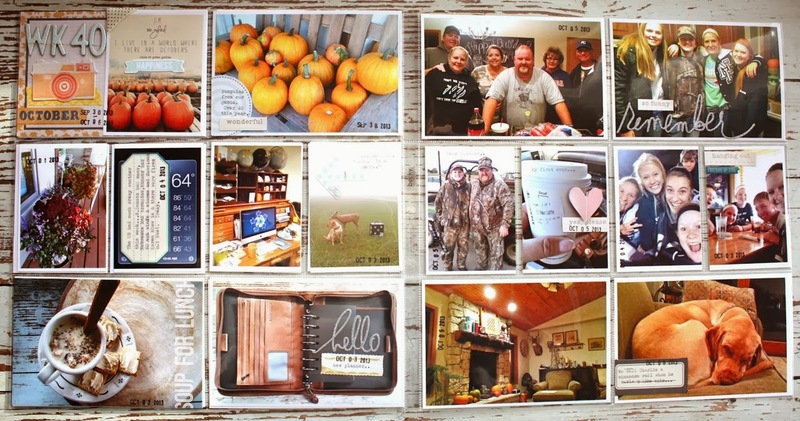 Speaking of journaling, I want to be sure to capture the stories and memories along with my photos this year. Since space may be limited in the pockets I've decided to use lots of iPhone apps to alter my photos with journaling, collages and added designs. 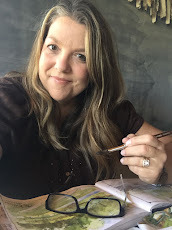 I'll make a list at the bottom of this post so you can see my favorite apps and how I'll be using them on my photos. I'll also be using my vintage typewriter for lots of journaling because my handwriting is so large and loopy...it takes up too much space. I may add a hand written letter somewhere to my family just to prove that I can actually write with a pen. Page 19 is wide open for now. The Tags are just slipped into the pockets and will be moved around and adhered over or under photos later on. Another example of adhering a dimensional item to the outside of a page protector. A little clustering of stars that still need something in the centers. 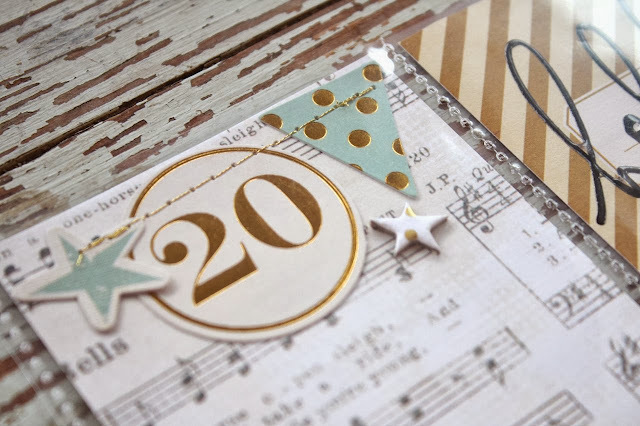 Day 20 is so pretty with all the neutral colors and gold foil accents. 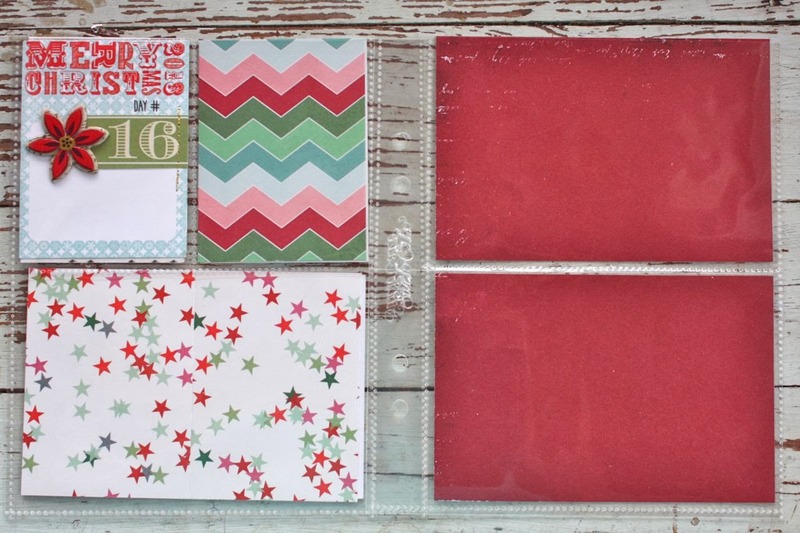 Since this page has the gold foil present in the bottom right I plan to use this layout for wrapping presents. I always try to snap a photo of my wrapping station, a fun holiday aisle at Target and the wrapped presents under the tree. 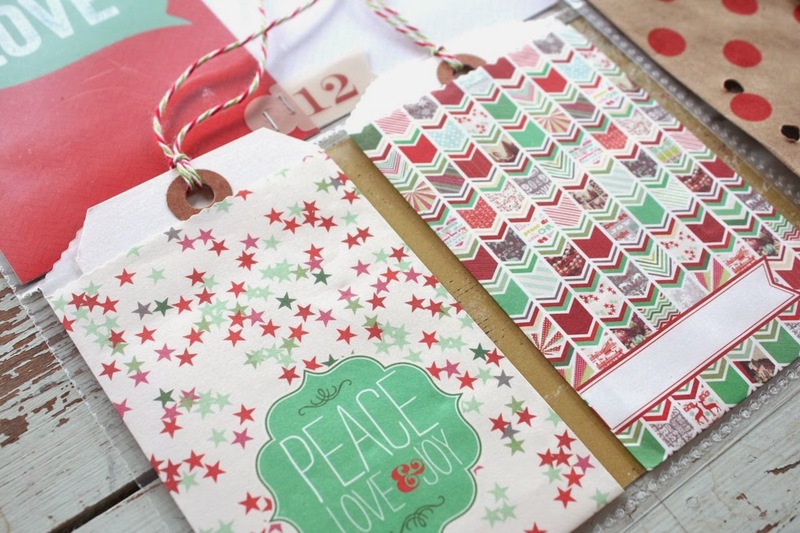 Maybe I'll even add in some actual wrapping paper snippets. 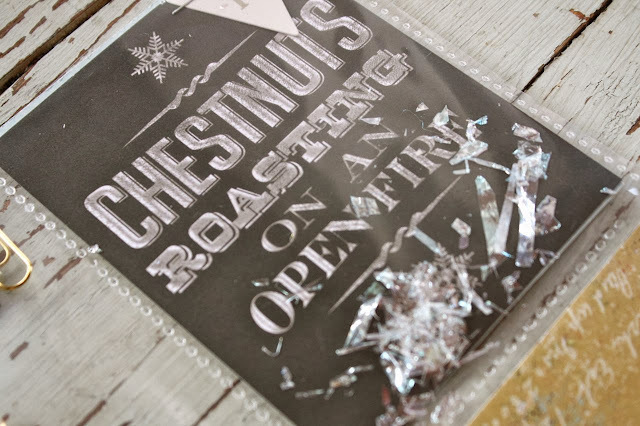 See these gold foil accents? I love them so much. And the gold stitching. 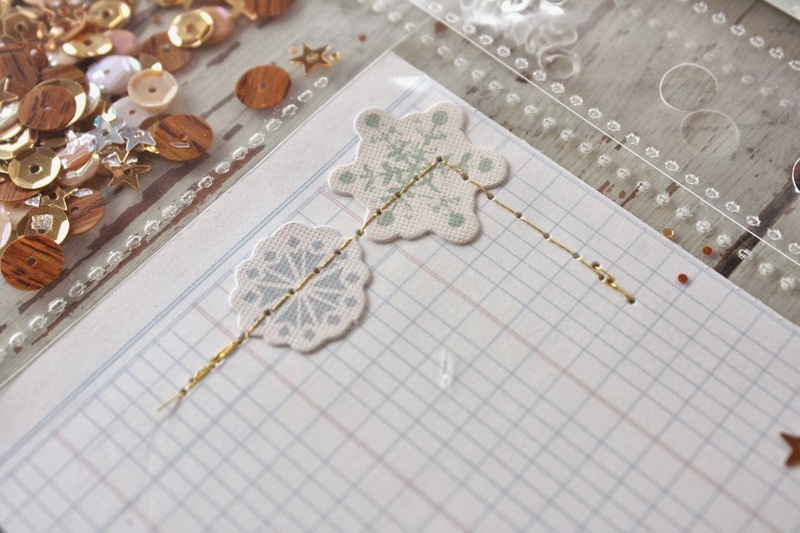 If you're looking for more gold to add to your holiday crafts, I have Gold Foil Doilies, Gold Shimmer Envelopes and Gold Clothespins still in the shop. Check out the Shimmer Swirl Envelopes & Paper too, this is mega gorgeous, folks. I will definitely be adding some of this into my holiday album. Okay, whew. That was some fun sharing of holiday inspiration. I would LOVE for you to leave a comment letting me know if you're doing a December Daily type album, if you got the GB December Memories Kit, what your plan is, what your progress is. Let's chat, shall we? Also, here's a list of the iPhone apps I'll be using to alter my photos for my December Memories album this year. I'm not sure if these are available for non iPhone users, you'll have to check. Once I have my photos edited and saved to my iPhone photo library, I email my photos to my big computer and save them in my iPhoto library. I don't use iCloud because I like to pick and choose what photos I send to my big computer. From there I add any additional editing using the iPhoto editing program and then print as squares. No Photoshop. 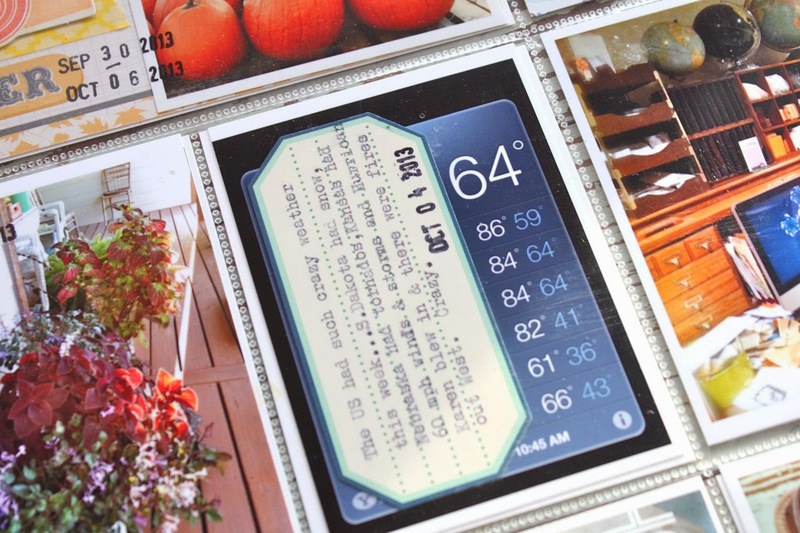 To print squares, I use my printer's settings to adjust the sizes to a 2 x 2, 3 x 3, etc then print on 4 x 6 photo paper. I use an Epson Artisan 730 and their Premium Photo Paper (I purchase at Staples). Love and highly recommend for great quality photos printed at home. One last thing for today. If you're looking to store your December Daily products in some fun, vintage items I have been putting up new listings in my shop all month long. I'll be shipping quickly for the holidays. 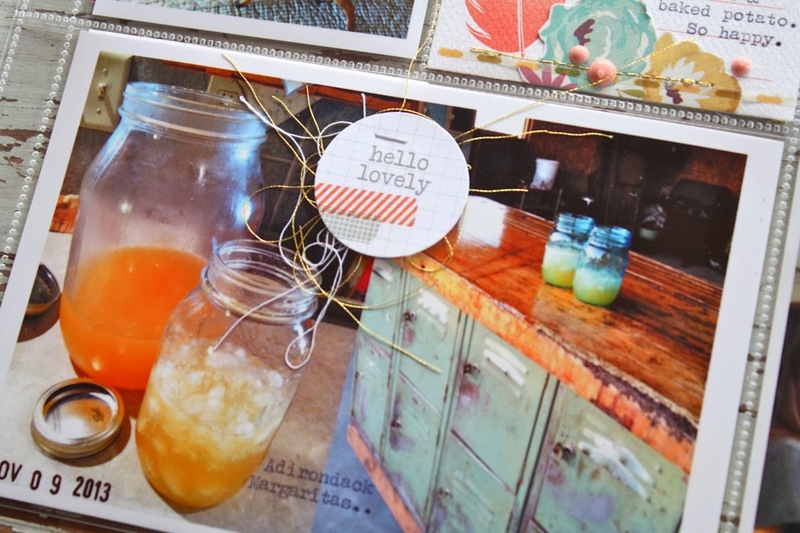 You might just find something fun...like lots of Jello molds like I love to use. You can check out my shop here. I combine shipping and refund back to your PayPal account for any large overages. Trucking right along with Project Life. 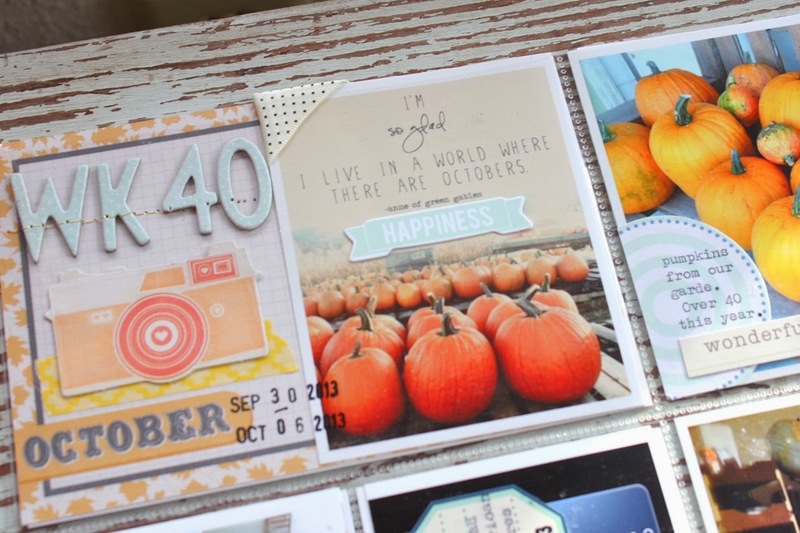 Today I'm sharing Week 40 which was prime pumpkin picking time. 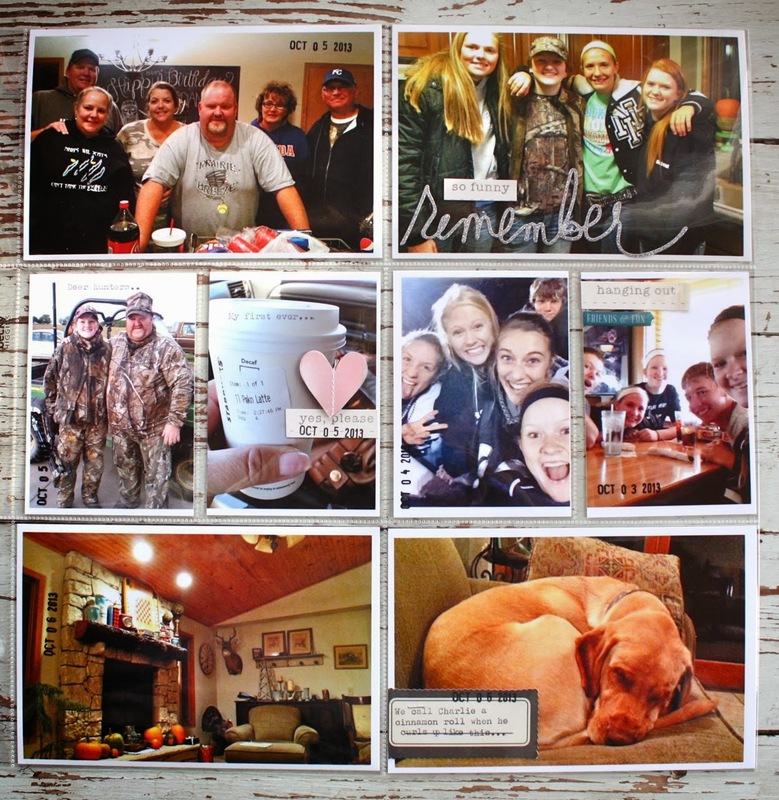 A photo in every insert which means 16 photos. 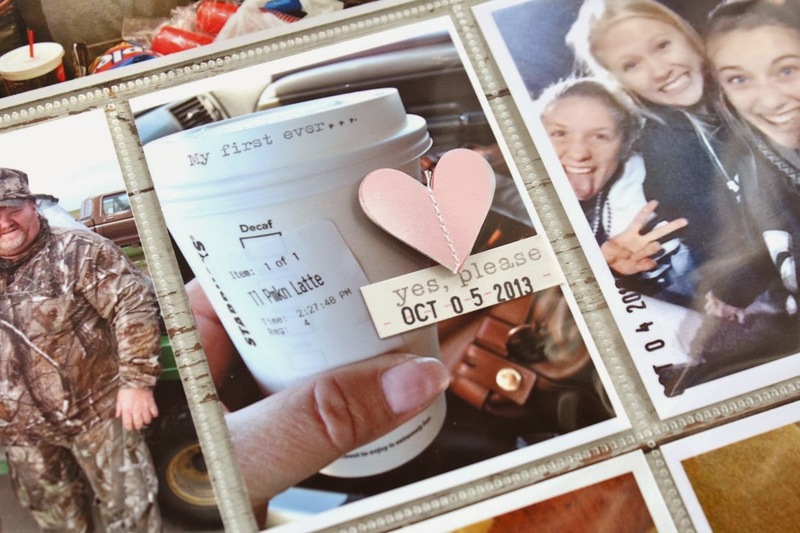 I find that I just keep filling the inserts with photos instead of lots of decorative accents. Which I love because that means I'm keeping the focus on the photos. 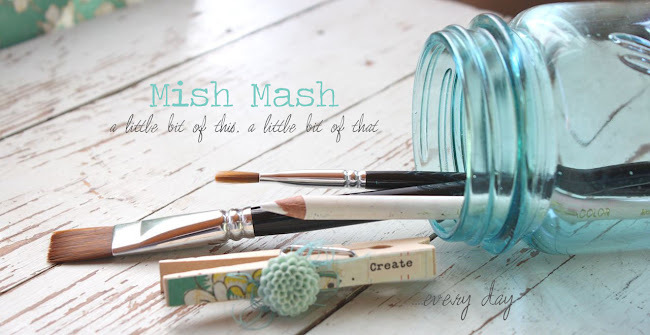 I love to embellish here and there but find such enjoyment from just the photos. I've found that I love to get all scrappy with the main, dated insert. 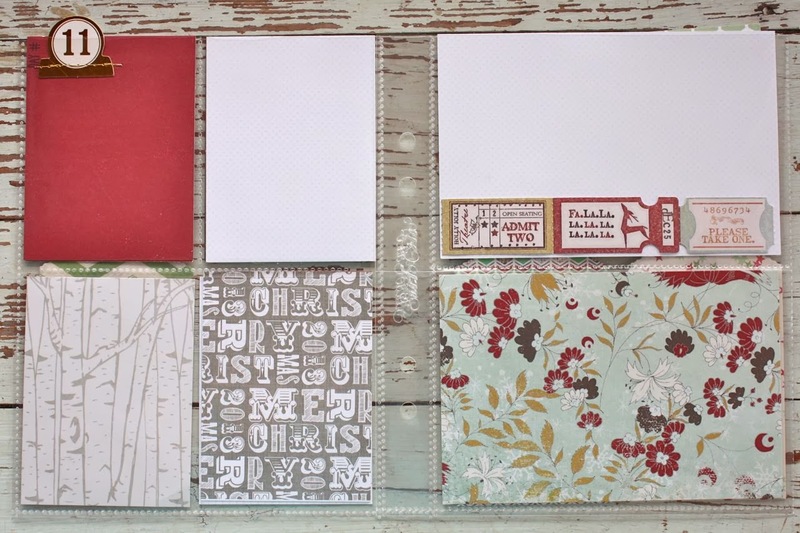 This is where I feel like I'm creating a mini scrapbook layout on a 4 x 6 space. That suits me just fine as those big 12 x 12 pages intimidate the heck out of me for some reason. 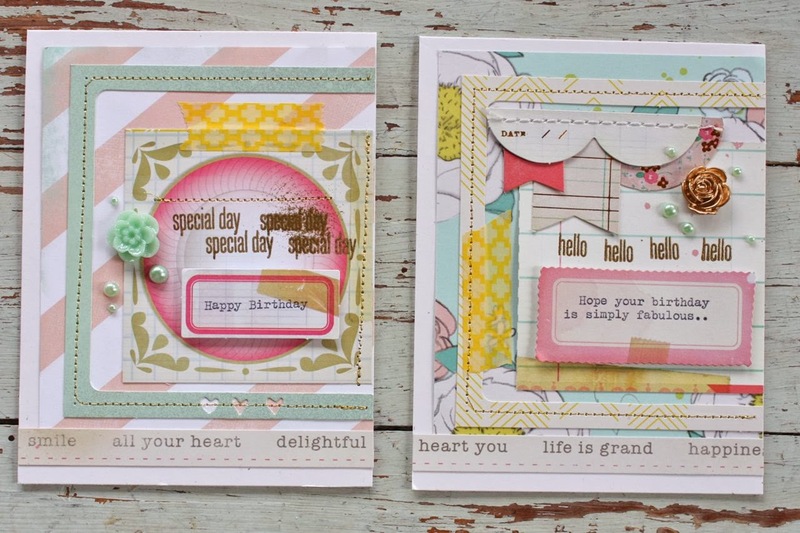 I think it's the card maker in me that likes working with the smaller format size. Below, I loved the photo with the quote I got from Pinterest. So pretty and vintage looking. 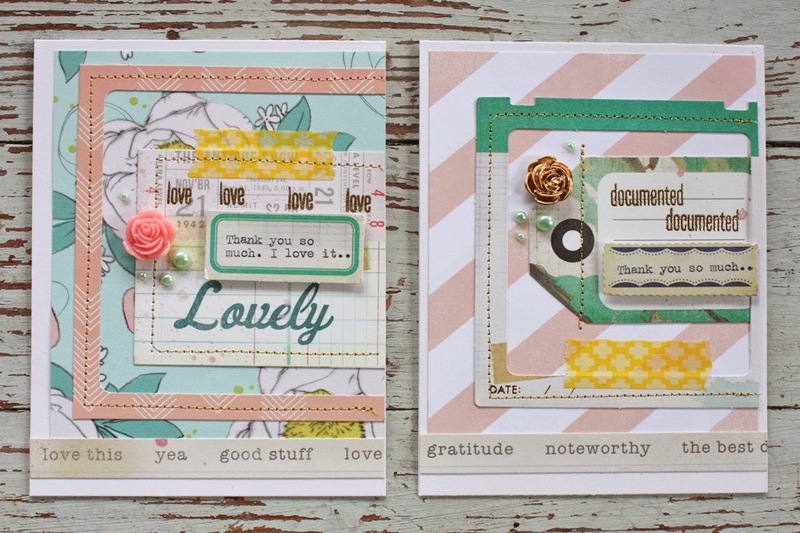 I also loved using the fabric photo corners from Gossamer Blue kits this week. Crazy weather all over the US this week. My first ever Pumpkin Spice Latte. It was yummy but it comes in second to the caramel something or other. Can you tell I don't drop $5 bucks for a coffee very often? Okay, another week in the books. Right now I am CURRENT. Well except for about 5 inserts of sports photos and our vacation week to Colorado. How about you? What's your status? 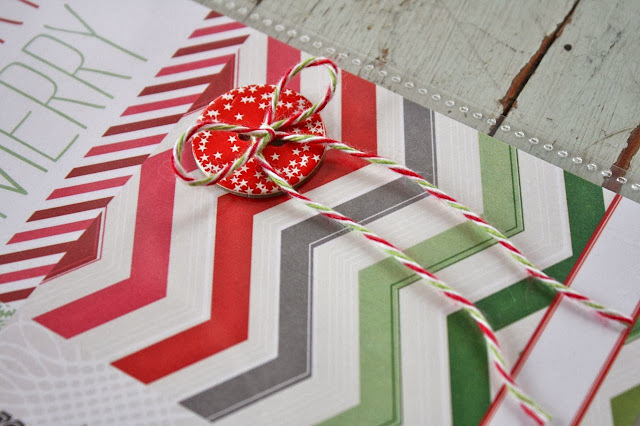 Coming soon....very soon.....my next 10 pages of my December Memories album. Hoping to get that on the blog before Thanksgiving. Hey, have you ever brined a turkey? Seems like everyone is on a brine kick so I'm joining in. Pioneer Woman's new cookbook is gonna get a workout this Thanksgiving. I'm totally in charge this year and bologna sandwiches just ain't gonna cut it. Eeeek, I'm excited. It's time for some Gossamer Blue December sneak peeks. There's a great line up of product coming in the kits. I love that I was able to use my Fall photos of my Life Pages and pair them with some new color combinations that I never would have thought of. 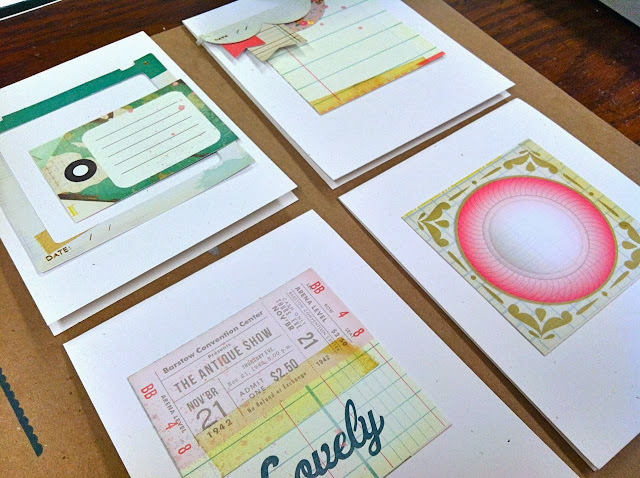 I also loved trying out some to me products like these wood journaling cards. Isn't it so fun when your new kits arrive? I so enjoy digging through a kit to find jus the right embellishment. Sometimes a photo just needs one small embellishments. 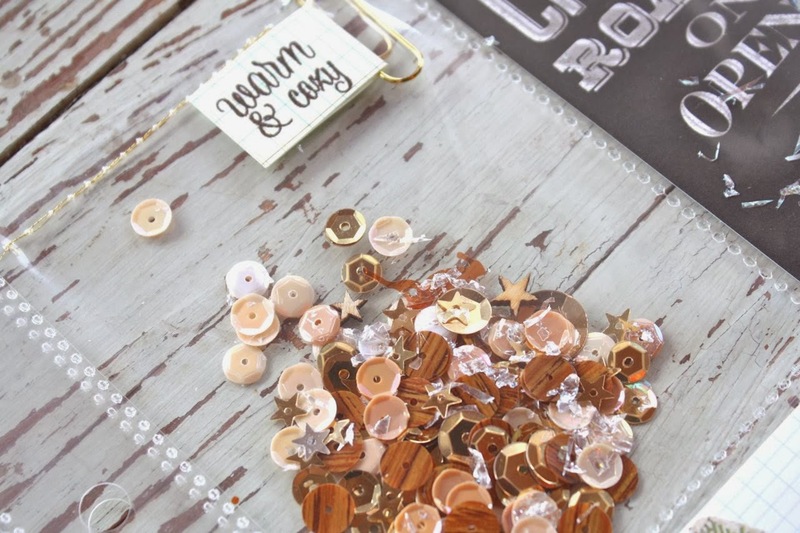 Love these little circle embellishments. I love the simplicity of this photo and the handmade sticker stitched on with gold thread was a simple finishing touch. 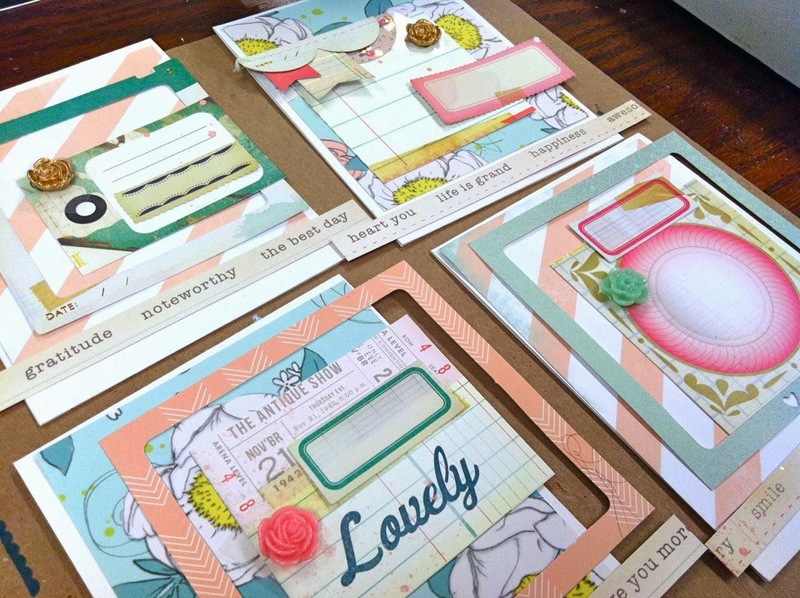 If you're looking for something new to try in your Life Pages then you'll want to be sure and snag the Main Life Pages Kit. 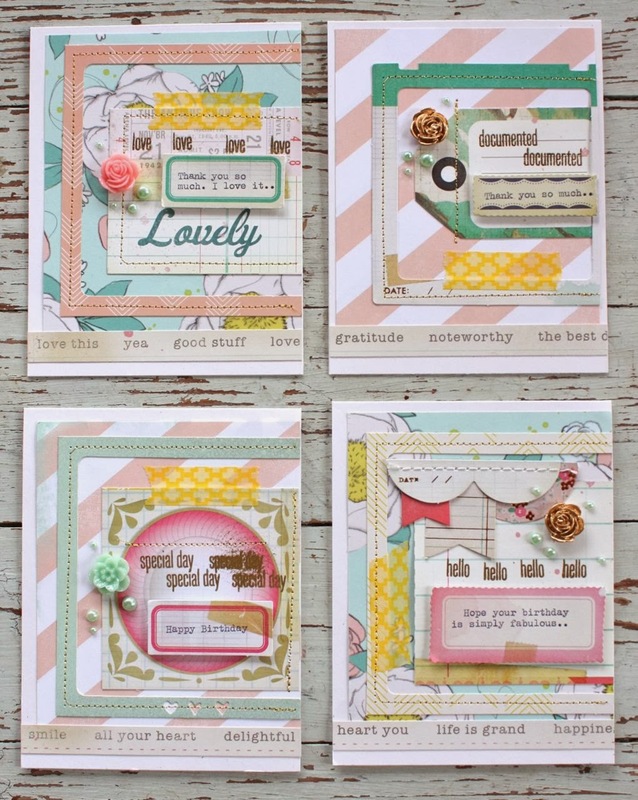 I've got a fun set of stamps to create detailed pockets. Look for a full tutorial and tips in an upcoming December Gossamer Blue blog post. 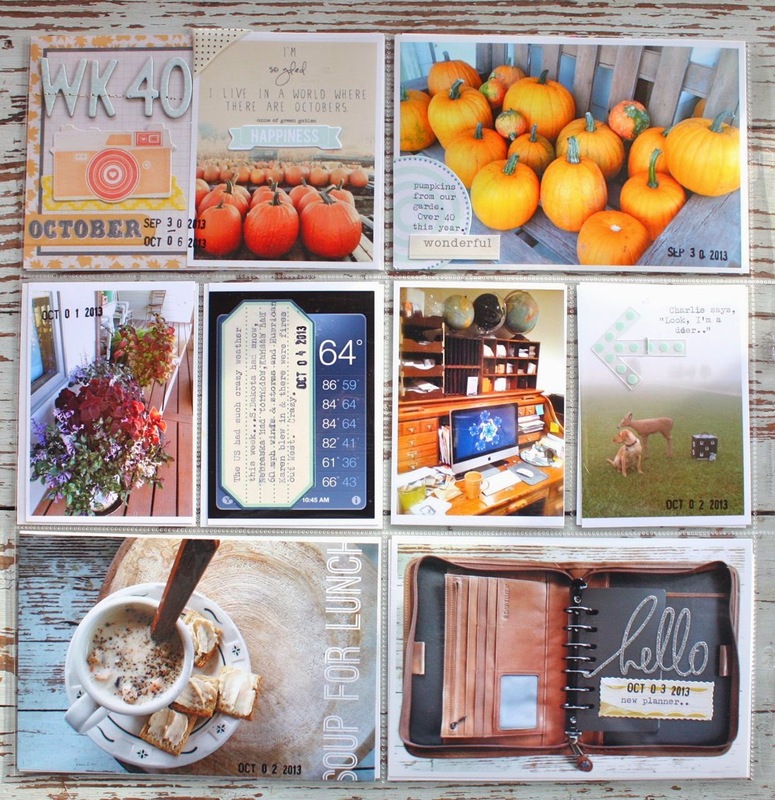 Again, I was able to put together the prettiest Fall color schemes from the assorted kits. I love that Fall doesn't have to be all about dark browns and pumpkin orange. Be sure to check the Gossamer Blue forum as there are lots more sneak peeks by the amazing Design Team. 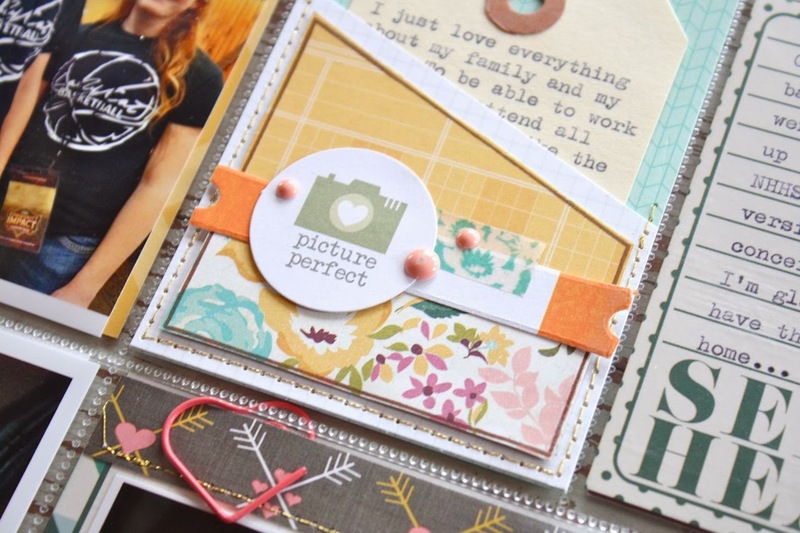 I've seen some of the projects trickling into the galleries and they are so inspiring. I'll be back to share my projects all throughout the month of December here on my blog. You can see them all on December 1st in the GB galleries. Thanks for stopping by today. Josey and I lit the first fire of the season so we're all toasty and warm today. How about some cards for today? I have a pretty little ensemble that I created using November Gossamer Blue Kits....the Main Add-On Kit, the stamps from the Life Pages Kit and a few more pieces here and there. 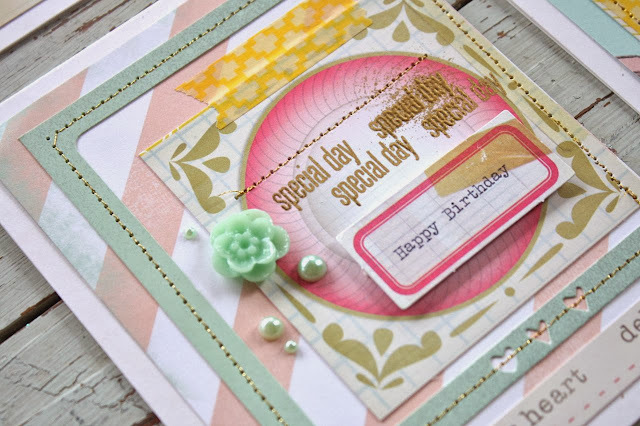 I like to use a lot of the leftover kit items for card making as it's a good way to use up supplies. These cards are scrappy, layered with lots of goodies and will be a good addition to my card stash. I started out with layering on some pieces I cut from a 12 x 12 tag sheet. 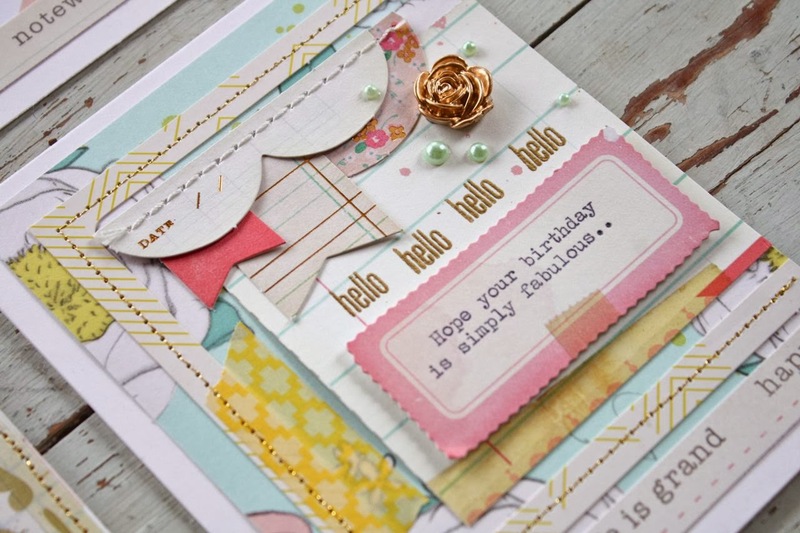 Next I added some frames and lovely background papers. 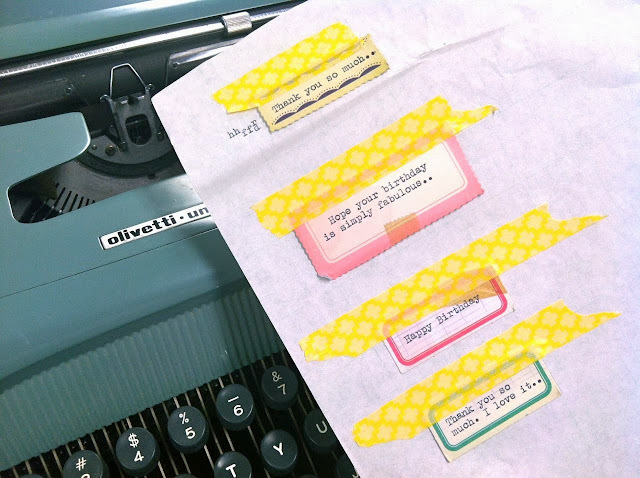 From there I cut strips of words from a 12 x 12 piece of patterned paper, added labels and placed on some embellishments. Then I just started adhering it all down. I used gold stitching which I just LOVE for these cards. 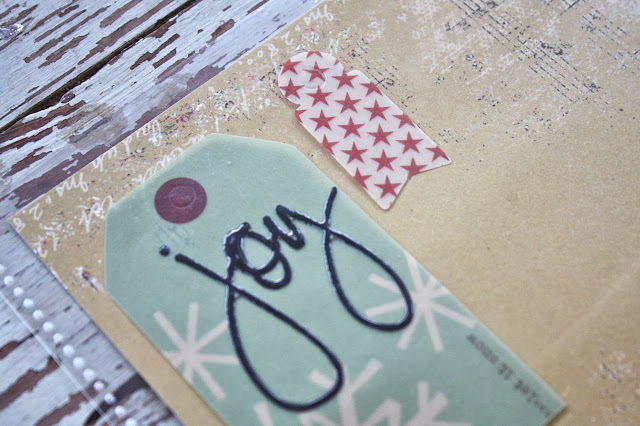 I embossed my stamps in gold also. 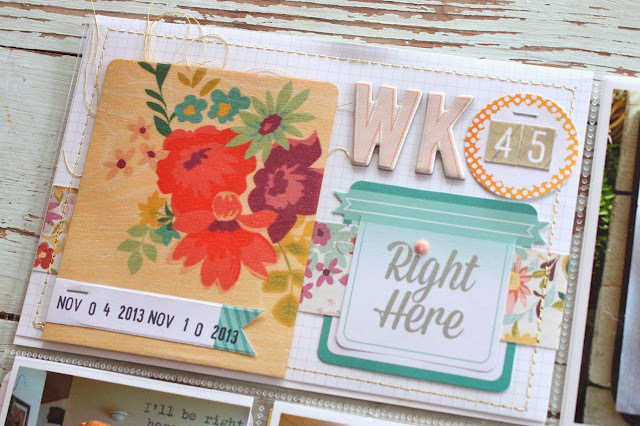 I added a small clustering of resin flowers and pretty sticker dots from my stash. Each card was finished with a piece of the yellow washi tape from the November Main Scrapbook Kit. All of the sentiment labels were popped up with foam dots. 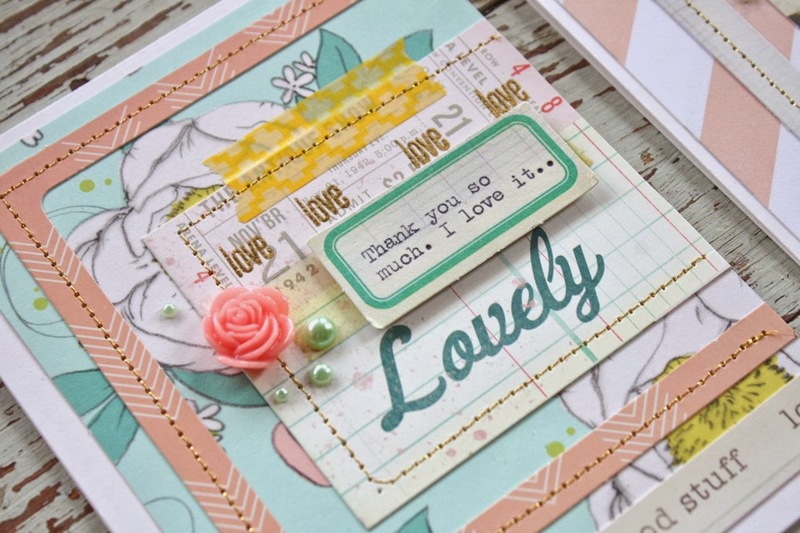 So pretty and soft & full of little details. Since these have quite a bit of dimension, I'll probably package them up using some Large White Sacks. Hope you enjoy! Coming soon, I'll be sharing the next 10 days of my December Memories album along with all the fun phone apps I plan to use to speed along the photo editing & journaling process.